Paper submitted to the ITJ-EM (Editorial Manager System) on December 22, 2018; and accepted on January 09, 2019. Citation: Delarestaghi MM, Mohebbi S, Basi A, Rahbar N, Karbasi Z, Karbasi H. The Protective Effect of Sertraline in Preventing Cisplatin induced Ototoxicity in Solid Organ Chemotherapy. Int Tinnitus J. 2018;22(2):175-180.
sertraline, cisplatin, ototoxicity, otoacoustic emissions, hearing loss. Cisplatin, as a platinum-based chemotherapeutic medication, is applied for various types of solid tumors . In spite of the high efficacy of Cisplatin and regarding the treatment of cancer cells, cisplatin is potentially accompanied by some side effects such as nephrotoxicity, neurotoxicity, and ototoxicity. A few agents and protocols are available, which can help to prevent these side effects, especially with respect to the prevention of cisplatin-related ototoxicity [2,3]. Increase in hearing threshold may occur in about 75%-100% patients after administering cisplatin [4,5]. The main risk factors which contribute to cisplatin-induced ototoxicity include extreme ages, higher dose and longer duration of drug use, simultaneous radiation therapy, anemia, and even some genetic vulnerabilities [2-6]. A large number of protective agents have been offered to lower the risk of cisplatininduced ototoxicity such as N-acetyl cysteine, sodium thiosulphate, amifostine, lipoic acid, salicylates, and even corticosteroids. The ability in controlling the side effects as a result of their antioxidant nature by neutralizing the cisplatin and increasing its urinary secretion is regarded as the main physiological feature of these agents . Nearly all of the above-mentioned agents limit and reduce the antitumor activity of cisplatin and its affinity . Further, High-Frequency Audiometry (HFA) and distortion product Otoacoustic Emissions (dpOAE) tests are mostly used for ototoxicity monitoring. In particular, HFA and dpOAE tests have been introduced in the references as the primary test of choice for early diagnosis of ototoxicity . HFA comprises air-conduction threshold testing for the frequencies above 4000 Hertz (Hz). HFA permits detection of aminoglycoside-induced or cisplatin-induced ototoxic losses well before changes become evident in the conventional range. Drug toxicities tend to be expressed first as OHC (Outer Hair Cell) dysfunction, and the relation of normal OAEs to intact OHCs is well established9. Recently, special attention has been paid to sertraline as a selective serotonin reuptake inhibitor for reducing cisplatin-induced ototoxicity. Potential advantages of sertraline may be related to neuroprotective and antioxidant effects (Increased anti-Apoptotic proteins levels), as well as its stimulation in the neurogenesis process (protect neurons against oxidative metabolic effects) [10,11]. However, a few studies have been conducted regarding the beneficial effect of sertraline in preserving the normal hearing threshold. As shown by Ozturk et al., lower ototoxicity rate was revealed in the group receiving sertraline in addition to cisplatin, compared to the group receiving cisplatin alone in rats . So far, no clinical trial has been reported on the protective role of sertraline against cisplatin-induced ototoxicity among humans. Therefore, the present study aimed to assess the protective effect of sertraline on preventing cisplatin-induced ototoxicity. The present prospective, double-blind, parallel, placebocontrolled, randomized clinical trial was performed among the patients suffering from different types of solid tumors such as Hodgkin lymphoma, non-follicular lymphoma, and malignant neoplasm of stomach, who gave all consent to chemotherapy treatment with cisplatin. All the patients, aged 20-65, were referred to the Oncology Clinic of Firoozgar Hospital as cancerous cases (Since November 2016 to November 2017). The patients with the history of previous chemotherapy with cisplatin or other ototoxic agents, suffering from head and neck tumors, receiving concomitant radiotherapy, wearing hearing aids, showing any evidence of severe otologic deficits, recent use of corticosteroids, any history of metabolic or chronic disorders, during pregnancy or breastfeeding, history of seizures, simultaneous use of Monoamine Oxidase Inhibitors (MAOIs), using antiarrhythmic drugs or warfarin, and at risk of any sertraline-related side effects such as respiratory disorders, palpitation, drowsiness, confusion, severe nausea and vomiting or other significant gastrointestinal problems, skin rashes, or extra pyramidal symptoms. First, the patients in the case group were randomly by using the blocked randomization methods with block of size four and assigned to receive sertraline for 3 months (50 mg oral tablet, Actoverco, and 25 mg/day which increased to 50 mg/day if tolerated), while the patients in the control group were assigned to receive placebo (CANDEREL, Aspartam tablet). Both groups received cisplatin under the same protocols (75 mg/M2 every 3 weeks with oneweek interval during 3 courses). The corresponding author was thoroughly responsible for randomization and recruitment of the patients for interventions. In addition, the audiometrist and the patients were all blind to the randomization. The effectiveness of the drug was determined assisted by CTCAE criteria and a grading measure was also defined by the study group for the effectiveness of sertraline or placebo in such a way that the effectiveness of the preventive drug was set equal to 4 for the individuals whose ototoxicity was found remaining at Grade 0 CTCAE following the use of drug or placebo and the same way the effectiveness power was considered 3 for Grade 1 CTCAE; it was considered 2 for Grade 2 CTCAE and equal to 1 for Grade 3 CTCAE and zero for Grade 4 CTCAE. The hearing of all patients was assessed using both HFA and dpOAE tests to determine the presence and severity of hearing loss at the baseline and after completing the treatments (3 months). According to Ozturk et al., the prevalence of ototoxicity among the patients receiving sertraline and those receiving the placebo were 42% and 79%, respectively12. Thus, a total sample size of 70 cases with 35 patients for each group was determined by considering a confidence level of 0.05 and strength of 90%. The results were presented as mean ± Standard Deviation (SD) for quantitative variables and were summarized by absolute frequencies and percentages for qualitative variables. Kolmogorov-Smirnoff test was used to determine the normality of the data. In addition, chi-square test was utilized for comparing qualitative variables. Further, t-test was used for comparing quantitative variables due to the normal distribution of the related data. p-values of 0.05 or less were considered statistically significant. In the present trial, 112 were recruited, among whom 33 were excluded. Forty-one patients who gave consent to chemotherapy under cisplatin received sertraline simultaneously. However, thirty-eight patients who received placebo were considered in the control group. As for its interferences with Cisplatin, consultations were made with the pharmacology experts before the study and, additionally, no drug interferences were observed in the references between these two drugs. The overall prevalence of complications pertained to sertraline (severe nausea and vomiting) was found among 35 subjects (11.4%), who were excluded from the study. In addition, two other patients were excluded due to lack of treatment. In the control group, 3 patients were excluded (2 for immediate death (One of these patients died in a car accident and the other died a natural death), and 1 for non-compliance with the treatment protocol). The study lasted for 3 months for each patient. In the case group, 17 individuals (48.6%) were male and 18 (51.4%) were female; while 19 cases (54.3%) were male and 16 (45.7%) were female in the control group (Table 1). No significant difference based on gender (p=0.632). Based on the results, the two groups were similar regarding age (45.6 ± 13.4 years vs. 44 ± 11.7 years) (p=0.592). Table 1. Number of participants for each group. Regarding audiometric assessment, 40.0% patients receiving sertraline and 31.4% receiving the placebo were normal. Mild hearing loss was observed among 25.7% and 31.4%, and moderate hearing loss among 34.3% and 37.1%, respectively, with no between-group difference (p=0.741). After the intervention, the ototoxicity grade based on the CTCAE criteria  was grade 0 in 71.4% and 5.7%, grade 1 in 20% and 20%, grade 2 in 2.9% and 45.7%, grade 3 in 5.7% and 22.9%, and grade 4 in 0.0% and 5.7% for the sertraline and placebo groups, respectively, which indicates a significant lower grade of deficits in the group receiving sertraline (p<0.001) (Figure 1). The effectiveness power of the sertraline, in the majority of patients, based on our result was 4 in 71.4% and for placebo was 2 in 45.7%. Figure 1: The grade of ototoxicity after intervention in the sertraline and placebo group. As illustrated in Figures 2 and 3, more preservation of hearing threshold in the sertraline group was significant in both females (p=0.000) and males (p=0.001). 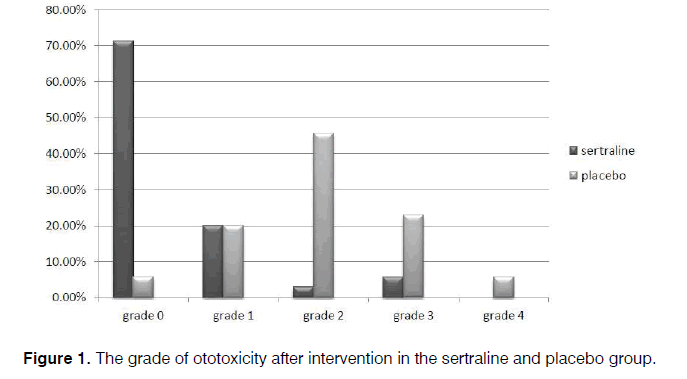 Figure 2: The grade of ototoxicity after intervention in the sertraline group among the males and females. Figure 3: The grade of ototoxicity after intervention in the placebo group among the males and females. In our cases, level of dpOAE is determined before taking the drug or placebo in which the actual level is stated as 2, 4, 6, and 8 KHz for each patient. After taking the drug, dpOAE has been applied for the patients afresh while the actual level of dpOAE for the patients after taking the drug has been deducted from its previous level. Difference in these two levels, that is, the level of dpOAE change, has been measured and determined for the participants under the title of “the change in dpOAE threshold” in Figure 4. Figure 4: The change in dpOAE threshold after intervention in the sertraline and placebo groups. Regarding the level of dpOAE before the intervention, levels of 2000 Hz in 11.4% and 5.7%, 4000 Hz in 8.6% and 28.6%, 6000 Hz in 14.3% and 5.7%, and 8000 Hz in 66.7% and 60% were detected in the sertraline and control groups, respectively, with no between-group difference (p=0.121). However, the reductions of 2000 Hz in 17.1% and 5.7%, 4000 Hz in 25.7% and 57.1%, and 8000 Hz in 0.0% and 20% of cases in both groups occurred by assessing the change in the threshold of dpOAE after medication at the end of the trial, compared to the amount gained at the beginning of the study. However, level of dpOAE was unchanged among 57.1% and 17.1% cases in the sertraline and placebo groups, respectively, which indicated a significant difference between the two groups (p=0.000) (Figure 4). Consequently, the lower the level of dpOAE decrease after taking the drug, the lower the grade of patient's ototoxicity. On the other hand, unchanged cases include patients with unchanged level of dpOAE after taking the drug and those without ototoxicity. Further, the reduction of dpOAE level in the sertraline group was significant for the women (p=0.002), compared to the amount for the men (p=0.07) (Figures 5 and 6). Figure 5: The change in dpoAE threshold after intervention in the sertraline group among the males and females. Figure 6: The change in dpoAE threshold after intervention in the placebo group among the males and females. The overall prevalence of complications pertained to sertraline (severe nausea and vomiting) was four among 35 subjects (11.4%), who were excluded from the study. As mentioned in the introduction, only a few studies were conducted on the beneficial effect of sertraline on preventing cisplatin-induced ototoxicity among cancer patients. Definitive effects of sertraline and its related pharmacological advantages induced from its protective effect are ambiguous yet. Therefore, the present study is the first human clinical trial in order to assess the protective effects of sertraline as a protective agent for preserving the hearing ability in patients. Based on the results, the use of sertraline with the initial dose of 25 mg/day and a maintenance dose of 50 mg/day could considerably reduce the risk of hearing loss among the patients who receive cisplatin. In addition, the dpOAE threshold decreased among a few patients who received sertraline. Of course, a considerable decrease was observed in the majority of the patients who did not receive sertraline. However, the occurrence of some serious complications related to sertraline administration such as severe nausea and vomiting forced the clinicians to modify the protective drug protocols or prescribe lower dosages of sertraline to prevent cisplatin-induced ototoxicity. However, all of the patients tolerated the 50 mg dose in the present study. Based on the results, changes in dpOAE among the men were not as significant as the amount among the women. In this regard, further studies can be conducted in larger sample sizes. As it was already mentioned, only one experimental study focused on assessing the protective effects of sertraline in preventing cisplatin-induced ototoxicity. Accordingly, Ozturk et al. reported that the risk for hearing loss was significantly lower in the animal samples receiving sertraline against the group receiving the placebo in different frequencies of 5642, 6165, 6726, 7336, and 7996 Hz. Regarding the pathophysiological effects of sertraline on hearing threshold, it seems that these effects may be originated from the neuroprotective nature of sertraline, which has inhibitory effect on 3-trinitropropionic acid, and consequently protects the cellular pathways against behavioral, biochemical, and mitochondrial defects. This inhibitory effect is clearly remarkable in the doses of 5 and 10 mg/kg . On the other hand, more human trials should be conducted by focusing on determining the physiological and biochemical effects of sertraline due to the indistinct role of sertraline in the changes in the cellular and molecular levels, along with the uncertainties in the clinical effects of the drug in preventing cisplatininduced ototoxicity. This kind of medication by sertraline may be useful since it is mainly used in treating psychiatric disorders and the patients with cancer have a lower life expectancy, which may even contribute to some degrees of depression. It is worth noting that this aspect of sertraline effect was not evaluated in the present study. Ethical Approval and Consent to participate: The authors assert that all procedures contributing to this work comply with the ethical standards of the relevant national and institutional guidelines on human experimentation and with the Helsinki Declaration of 1975, as revised in 2013. All the protocols were approved by the ethical committee at Iran University of Medical Sciences (IUMS) with Code of ethics: IR. IUMS.REC1395.9311369005 and the Iranian Registry of Clinical Trials (IRCT). Informed Consent: Informed written consent was received for publication of the manuscript and figures [the patient data presented in Table 1/ the information in the figures/ manuscript]: “Written informed consent was obtained from the participants for publication of their individual details in this manuscript. The consent form is held by the authors and is available for review by the Editor-in- Chief”. The written informed consent was received from all participants before entering the study. Based on the results, the use of sertraline with a daily dose of 50 mg in the adults who gave consent to chemotherapy treatment with cisplatin could significantly result in preserving hearing threshold. It seems that this prescribed intake of the drug can be tolerated by most of the patients and the protective protocols should be modified just for a few of the patients. Anemia was not excluded from the present study due to its high risk in patients with gastric cancer. Thus, attempts were made to divide the groups just by randomization. Finally, the patients' observation lasted for only three months, while some of the changes in the hearing threshold may appear and arise beyond that length of time. The authors wish to thank Dr Manijeh Motevalian, MSc. PhD from the Department of Pharmacology & Razi Institute, Drug Research, Iran University of Medical Sciences for her thoughts and comments on this work. McKeage MJ. Comparative adverse effect profiles of platinum drugs. Drug Saf 1995;13(4):228-44. Marshak T, Steiner M, Kaminer M, Levy L, Shupak A. Prevention of Cisplatin-induced hearing loss by intratympanic dexamethasone: A randomized controlled study. Otolaryngol Head Neck Surg. 2014;150(6):983-90. Chirtes F, Albu S. Prevention and restoration of hearing loss associated with the use of cisplatin. Biomed Res Int. 2014:925485. Barahmani N, Carpentieri S, Li XN, Wang T, Cao Y, Howe L, et al. Glutathione S-transferase M1 and T1 polymorphisms may predict adverse effects afteratherapy in children with medulloblastoma. Neuro Oncol. 2009;11(3):292-300. Caronia D, Patiño-García A, Milne RL, Zalacain-Díez M, Pita G, Alonso MR, et al. Common variations in ERCC2 are associated with response to cisplatin chemotherapy and clinical outcome in osteosarcoma patients. Pharmacogenomics J. 2009;9(5):347-53. Peters U, Preisler-Adams S, Lanvers-Kaminsky C, Jürgens H, Lamprecht-Dinnesen A. Sequence variations of mitochondrial DNA and individual sensitivity to the ototoxic effect of cisplatin. Anticancer Res. 2003;23(2B):1249-55. Riedemann L, Lanvers C, Deuster D, Peters U, Boos J, Jürgens H, et al. Megalin genetic polymorphisms and individual sensitivity to the ototoxic effect of cisplatin. Pharmacogenomics J. 2008;8(1):23-8. Rybak LP, Whitworth CA, Mukherjea D, Ramkumar V. Mechanisms of cisplatin-induced ototoxicity and prevention. Hear Res. 2007;226(1-2):157-67. American Academy of Audiology. Position statement and clinical practice guidelines: ototoxicity monitoring. 2015. Duan W, Peng Q, Masuda N, Ford E, Tryggestad E, Ladenheim B, et al. Sertraline slows disease progression and increases neurogenesis in N171-82Q mouse model of Huntington's disease. Neurobiol Dis. 2008;30(3):312-22. Kumar P, Kumar A. Possible role of sertraline against 3-nitropropionic acid induced behavioral, oxidative stress and mitochondrial dysfunctions in rat brain. Prog Neuropsychopharmacol Biol Psychiatry. 2009;33(1):100-8. Ozturk M, Ucar S, Sarı F, Erdogan S, Topdag M, Iseri M. Possible protective effect of sertraline against cisplatin-induced ototoxicity: an experimental study. Scientific World Journal. 2013;523480.